Tobacco use is the leading cause of preventable death and disease in this country. Our Tobacco Education program offers several ways to help people quit using tobacco including free tobacco cessation counseling. Offered both one-on-one or in a group setting, our tobacco cessation counseling works with tobacco users to determine where they are on the quitting path and helps to make a personal quit plan for long-term quitting success. Our team is here to support you should you need assistance during this transition. As part of our mission and vision to protect the health of our community, Mid Coast–Parkview Health buildings, surrounding areas, and parking lots became 100% smoke- and tobacco-free in 2014. In 2018, Mid Coast Hospital was recognized as Platinum by the Breathe Easy Coalition for excellence in implementing best practice tobacco-free policies and procedures. 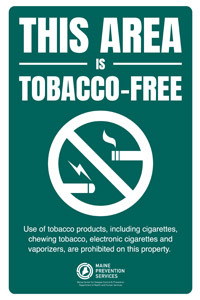 Mid Coast Hospital is a Maine Tobacco Prevention Partner, a statewide Maine Prevention Services initiative coordinated by MaineHealth Center for Tobacco Independence. Prevent all types of tobacco use (including e-cigarettes) among youth and young adults statewide. Prevent all ages from exposure to second-hand smoke in public places such as housing, colleges, daycares, schools, and lodging. For help with policies or education, please call our Tobacco Prevention Team at (207) 373-6957. >> Take the Smoke-Free Home pledge today. >> Information about JUULing and e-cigarettes for parents and teens.